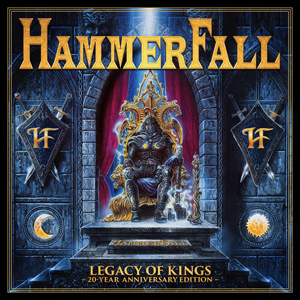 Swedish metallers, HAMMERFALL, have announced the 20th anniversary reissue of their second album, Legacy Of Kings, as 2-CD/DVD boxset, out on December 7th via Nuclear Blast. "The all-important second album. After the immediate success of Glory To The Brave, the pressure was on us to deliver. But we weren’t worried, we had a vision of the perfect heavy metal band and were intent on following through on it," explains Oscar Dronjak. Get an impression of the release in the video trailer below. "At The End Of The Rainbow"